On Nov 20th we’re joining forces with the Dying Matters team and local hospices to run a day of workshops all about what you can do to make Dying Matters week work for your community. 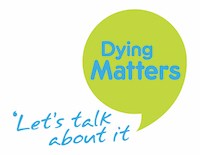 Brum YODO’s Sharon Hudson will be talking about Death Literacy alongside other regional speakers who will be sharing their Dying Matters event experiences. Workshops leaders include our team members from A Natural Undertaking, Carrie and Fran, and the Birmingham Artivistas, our “A Matter of Life and Death Festival” artists in residence, Jane Thakoordin and Margaret Murray. A special treat will be a live performance by Joanne Tremarco whose performance of the Birth of Death was a highlight of A Matter of Life and Death 2018.